CHICAGO--(BUSINESS WIRE)-- Hyatt Hotels Corporation (NYSE: H) today announced the opening of Hyatt Regency Suzhou in Suzhou, one of the most important economic, cultural and historic cities of Eastern China, neighboring Shanghai. The city of Suzhou, known as “the Venice of China,” is renowned for its ancient canals, stone bridges and UNESCO-listed classic gardens. Hyatt Regency Suzhou provides contemporary comfort and high-tech amenities to business and leisure guests in the thriving heart of this historic city. Strategically nestled in the Suzhou Industrial Park (SIP) with a subway station at its doorstep, Hyatt Regency Suzhou is part of Jinghope Plaza, a new complex project that includes a luxury shopping mall, entertainment venues and two Grade-A office buildings. 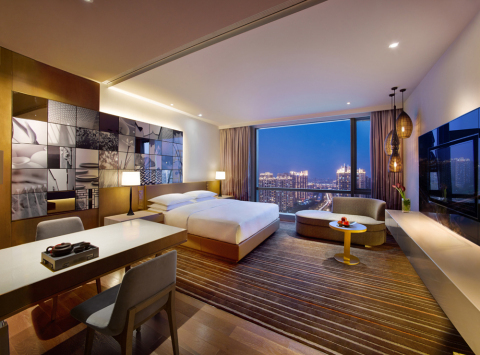 Hyatt Regency Suzhou is a key connecting point between Suzhou and Shanghai, offering easy accessibility to visiting guests. It takes just 25 minutes by train to reach Shanghai, one hour by car to reach Shanghai Hongqiao International Airport, and 10 minutes by car to reach Suzhou SIP Railway Station, the transportation hub of Yangtze River Delta region. Neighboring the picturesque Jinji Lake, Suzhou Culture and Arts Center, Suzhou International Expo Center and the Ferris Wheel Park, Hyatt Regency Suzhou will also provide a convenient blend between the ancient Suzhou city and new district. The hotel offers 355 spacious guestrooms and suites plus a Regency Club. There are five restaurants and lounges, more than 15,000 square feet of innovative meeting, event and wedding venues, and spa and wellness facilities. The refreshing, contemporary design by LTW Designworks features a breathtaking 29-story triangular atrium topped with a glass roof. The interior design is inspired by Suzhou’s classic gardens offset by large-scale contemporary artworks that reference the modern face of Suzhou. Hyatt Regency Suzhou’s 355 contemporary guestrooms encircle an eye-catching 29-story atrium, offering impressive city views from every room. The bright, modern design incorporates Suzhou stylistic influences – from a large black-and-white mural featuring snapshots of classical architecture and garden images to woven cane lanterns and an abundance of natural woods and textures. Starting at a spacious 430 square feet, all guestrooms offer premium amenities, including: a large-screen LED TV with satellite channels and free on-demand movies; coffee and tea sets; individually controlled air conditioning; and complimentary high-speed broadband/Wi-Fi Internet access. An oversized table is equally comfortable as a work desk and dining table. Bathrooms feature a deep-soaking tub, spacious shower and separate toilet, plus all-natural Portico bath products. Regency Suites, starting at 968 square feet, feature a separate living/dining area, a Nespresso coffee machine and freestanding window bathtub. The Regency Club provides the highest level of personalized services, including exclusive access to the 28th floor’s Regency Club lounge, serving complimentary breakfast, all-day refreshments and evening cocktails. Guests can also enjoy the Regency Club boardroom, express check-in/out and dedicated receptionist and concierge services. Hyatt Regency Suzhou brings Hyatt-renowned dining experiences to Suzhou with five destination restaurants and lounges. The hotel offers both international flavors and authentic local dishes with fresh seasonal ingredients. Ascending the grand staircase from the lobby, the second floor’s Hua Chi 88 is a vibrant Chinese dining restaurant serving authentic Suzhou and Huaiyang cuisines, Taihu Boat cuisine from nearby Tai Lake, and the city’s finest Peking Duck roasted over fruitwood in the traditional duck oven. Live show kitchens throughout the dining room add to the theatrical atmosphere. Six private dining rooms feature large windows and private bathrooms. The Fireplace on the third floor is an international grill restaurant with a sophisticated European bistro-style ambience. The open kitchen serves up Italian pizzas and grilled specialties from the Mediterranean, Japan, Korea and northern China. Wood-paneled walls, mounted animal heads and peacock blue, semi-circular booths make it a destination to impress. The Fireplace also features a mosaic and marble bar with a Manhattan vibe, ideal for relaxing before or after dinner with an artisanal cocktail, such as the signature Whisky Sour. Tea House on the ground floor combines the conviviality of a traditional Chinese teahouse with a modern style, and it serves light snacks, tea-inspired beverages and cocktails. By day, it’s a great place to work, meet and socialize with free Wi-Fi. By night, Tea House transforms into a relaxed bar with live musicians playing on a stage behind the cocktail bar. Beneath the magnificent 29-story atrium, The Atrium is an elegant spot for informal meetings and gatherings. Market Café occupies a second-floor space with double-height windows where guests can eat out of the pan, off the grill and out of the wok. The freshest ingredients are used to create a la minute dishes from across China, Asia and the world, plus a delicious dessert selection. Hyatt Regency Suzhou is the place for every occasion with more than 15,000 square feet of innovative meetings and events space. The Residence is a new-concept events venue comprised of four multifunctional rooms with large French windows, hosting up to 360 guests. The rooms feature versatile sliding screens that open onto a large foyer, and a dedicated Loft Kitchen is fully equipped for creative dining experiences. The Residence is ideal for conferences, meetings and cocktail events. It is also a great choice for wedding parties and family gatherings. Designed in contemporary style, the 6,240-square-foot Regency Ballroom can host up to 450 people for a cocktail event and 340 for a private dining event. The ballroom can also be divided into two rooms for smaller gatherings. A large VIP/Bridal Dressing Room and lounge are available. All venues are appointed with advanced technology and communications systems as well as complimentary wireless Internet connectivity. A private street-front entrance provides exclusivity. Yue Spa at Hyatt Regency Suzhou is designed to restore and maintain the natural equilibrium, or “yin yang,” which is critical to human wellbeing. Six private spa suites plus two reflexology areas provide a full range of body and facial treatments. Spa guests can enjoy the hydrotherapy facilities featuring Roman-style baths and an oversized steam room. Signature treatment combines traditional Chinese techniques with using a choice of aromatherapy or therapeutic oils. Authentic Traditional Chinese Medicine (TCM) treatments are also available in Yue Spa, together with a certified TCM doctor and Tai Qi master ready for consultations and movement practice. The hotel also features a 25-meter indoor swimming pool on the third floor with floor-to-ceiling city views. As an added artistic touch, the pool is framed by intricate mosaic artworks featuring scenes of old Suzhou canal. The 24-hour fitness center offers the latest TechnoGym EXCITE+ and ELEMENT+ cardio and strength equipment, which enables guests to share their workout stats via social media apps. The Hyatt Regency brand is an energizing hotel brand that connects travelers to who and what matters most to them. More than 140 conveniently located Hyatt Regency urban and resort locations in over 30 countries around the world serve as the go-to gathering space for every occasion – from efficient business meetings to memorable family vacations. The brand offers a one-stop experience that puts everything guests need right at their fingertips. Hyatt Regency hotels and resorts offer a full range of services and amenities, including notable culinary experiences; technology-enabled ways to collaborate; the space to work, engage or relax; and expert planners who take care of every detail. For more information, visit hyattregency.com. Hyatt Hotels Corporation, headquartered in Chicago, is a leading global hospitality company with a proud heritage of making guests feel more than welcome. Thousands of members of the Hyatt family strive to make a difference in the lives of the guests they encounter every day by providing authentic hospitality. The Company's subsidiaries manage, franchise, own and develop hotels and resorts under the Hyatt®, Park Hyatt®, Andaz®, Grand Hyatt®, Hyatt Regency®, Hyatt Place®, Hyatt House®, Hyatt Zilara™ and Hyatt Ziva ™ brand names and have locations on six continents. 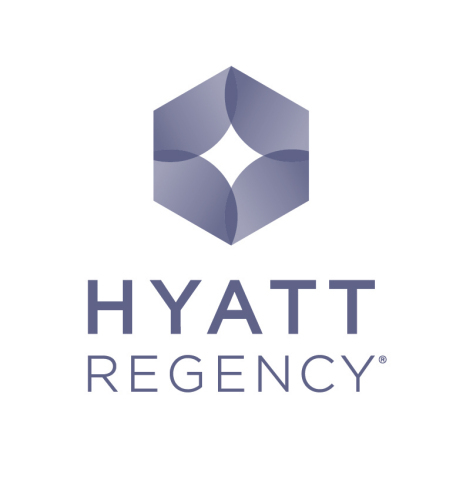 Hyatt Residential Group, Inc., a Hyatt Hotels Corporation subsidiary, develops, operates, markets or licenses Hyatt Residences® and Hyatt Residence Club®. As of June 30, 2014, the Company's worldwide portfolio consisted of 563 properties in 48 countries. For more information, please visit www.hyatt.com.